To Ulfar Thormodsson, the Viking town of Stenvik is the penultimate stop on a long journey in this riveting adventure of clashing Viking powers. Tasked with looking after his cousin after disgracing his father, he has traveled the world and now only wants to go home. Stenvik is different: it contains the beautiful and tragic Lilja, who immediately captures Ulfar’s heart-–but Stenvik is also home to some very deadly men, who could break Ulfar in an instant. 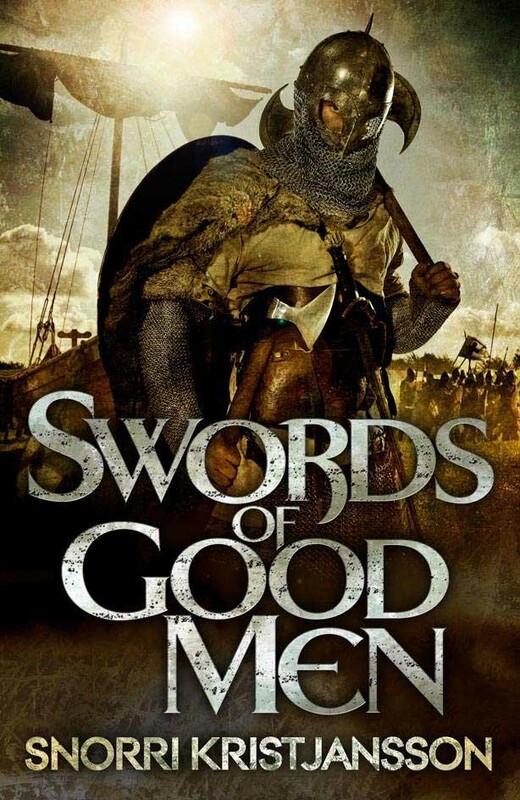 Swords of Good Men is Snorri Kristjansson’s debut novel from Jo Fletcher Books. Very much in the vein of David Gemmell, it’s a Viking fantasy with a style not unlike Joe Abercrombie. Kristjansson has taken Norse myth and made a story where the Gods undoubtedly exist – Thor, Loki, Freya, Odin – they’re all here, and not just in passing mentions. The town of Stenvik stands at the absolute centre of this novel – every character and plot thread drawn towards it for different reasons. Kristjansson’s biggest asset, for me, is his relentless writing style. The prose is quick, accomplished and action-packed. The actual action sequences here are literally breath-taking. As the novel is essentially the story of one fairly complex viking siege, it is essential that the action and the violence leaps off the page, and there is absolutely no doubt that Kristjannson has accomplished just that. It never feels stale, always feels shocking and remains the novels biggest strength. Many of the characters too feel well-rounded and realistic. They have values which feel true to what I’d imagine Norsemen would have, but with a modern mindset and tone of voice which makes it easy to comprehend. On the other side of the same coin, the female characters here are worrying. In a cast of probably a dozen or more POVs – which is far too many for a book this short – there is one female POV, and I think she accounts for maybe two pages of actual text. Beyond that we have Freya, the Goddess of Love – who features only in the background, a borderline psychotic woman who felt terribly underused, and arguably the main villain who lacked clarity or reasoning which I think could have helped fill out her character and ultimately, would have given the book a denouement which may have made a little more sense if I could have empathised with her more. The fragmented POV style of Swords of Good Men is its other main failing. The constant (and I do mean every few paragraphs) switching of POVs and locations is confusing at best and irritating at worst. Just as certain characters begin to develop, or the reader starts to understand what’s happening, we’re whisked off to another POV in another place and left confused all over again, before changing to someone else, and again, and again. It’s not that I completely dislike this style of storytelling, and I think that particularly in the latter third it works brilliantly, as we headhop in some exhilarating fight sequences – a lot like what Joe Abercrombie did with The Heroes – but to use this style of headhopping throughout the novel, from almost the beginning is very difficult to follow. The fact that this is not a simple tale of one side vs another, but rather one with three, four, five sides at play, makes for a confusing read; especially as it moves at such a pace. Swords of Good Men would make a brilliant action film. It’s quick, violent and action-packed from the start. The fantastical elements are there, but not overpowering. It occasionally reads like a film script treatment with its fractured storytelling. For all the issues I had while reading it, I was completely engrossed by the end and read the entire thing in one afternoon. It’s a good debut and hopefully the start of something which could get a lot better. For now I’m looking forward to the sequel in the hope that we’ll get a bit more substance to accompany the style. A series worth a look according to Wilder’s book review. Its on my radar.